But here's the honest truth: Not just skepticism toward state power, but a strong antigovernment sentiment, are natural and logical results of taking a close look at the state and its works--its bloody, heavy-handed works. Click for larger image/Prison Policy InitiativeWhen Georgetown University bioethicist Lawrence O. Gostin cheers on former New York City mayor Michael Bloomberg's nanny-state meddling and writes, "the public health approach rejects the idea that there is such a thing as unfettered free will," he forgets (or doesn't care) that using the law to clamp fetters on us unhealthy saps creates more rules and regulations that we could ever possibly obey. When Time magazine's Michael Grunwald huffs, "I guess you could call me a statist...we do need Big Government to attack the big collective-action problems of the modern world," he overlooks the ranks of those on the receiving end of that Big Government attack. 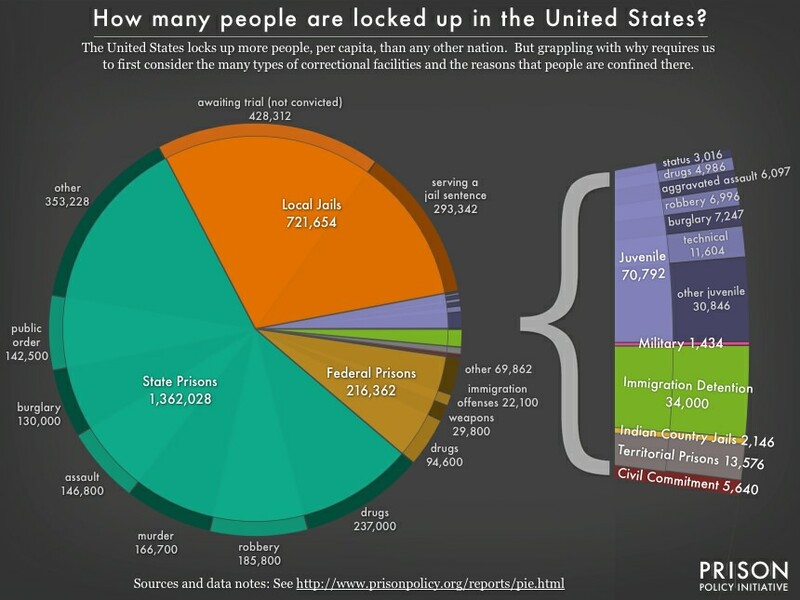 Those who now fill the nation's jails, prisons, and detention centers, says the Prison Policy Initiative, number about 2.4 million people. U.S. Department of JusticeFormer Reasoner Radley Balko wrote 2013's Rise of the Warrior Cop to document the increasingly military-style weapons, attitudes, and tactics of the nation's police forces as they enforce those myriad laws and keep the prisons stuffed to the brim. Last year he wrote in the Huffington Post, "too many cops today have been conditioned to see the people they serve not as citizens with rights, but as an enemy." Much influenced by Emerson, and anticipating Rummel by over a century, Henry David Thoreau commented, "'That government is best which governs least'...Carried out, it finally amounts to this, which also I believe, — 'That government is best which governs not at all.'"